All of my twelve regular readers (hi mom! 👋) might have noticed that I’ve moved my blog again. After a journey of a few years to Medium and then Squarespace, my blog is back on a self-hosted WordPress site. I’ve been hosting my own website since 1995, but didn’t have my own domain until 2001. In 2001, I registered schouwenburg.nl. I remember that before 2001 you were not allowed to register a .nl internet domain as a person. Typical Dutch institutional thinking; why would a person need a internet domain? This can only lead to problems, let’s just prohibit it. It’s better that way. Of course some smart Dutch person founded a company called Ladot and offered to register the domains for you and then rent them back to you. A couple of years later SIDN (institute who manages .nl domains) came to their senses and changed their policies. 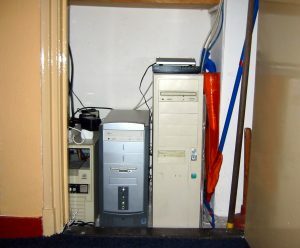 In 2001, my site run on Typo3 CMS on a Linux PC in my hallway closet – no joke. I did this for 10 years. I even moved everything from The Netherlands to New York. It was offline for 5 weeks while my server was in a container traveling on a boat from Rotterdam to New York, but that’s ok right? Somewhere in between I migrated from Typo3 to WordPress. In the early days WordPress was pretty ghetto. It got hacked all the time – even when you (tried to) kept up with all the updates. My site got defaced at least once a month. In 2012, I moved to a shared host, but after years of neglect it became a administration nightmare. Upgrading was a problem because it broke my templates and not upgrading meant that my site got hacked. It happened a few times. Sometime in 2015, Medium became a thing and it offered quite a nice place to bring your blog to life. One of their more interesting features was the ability to create a magazine. You could intersperse your own posts with posts from others and create an interesting reading experience. But when Medium grew, it became like all other social media platforms. They turned it into a feed like Twitter and Facebook. The magazine feature got scrapped. But the feed also creates problems. The biggest problem with feeds is that the harder you work, the more exposure you got but everybody else was left with nothing. I got less readership of my posts on Medium than when I hosted it myself. I’m sure it was my lack of active promotion and most probably my stuff wasn’t that interesting anyway, but it bugged me. It felt like my stuff fell into the black hole of social media. One of the interesting later changes to Medium was the ability to redirect your domain to your Medium host blog. It worked ok and it gave me my own place. I was no longer shackled to the “feed”. But that platform also had major limitations. It was only about articles and posting. There were only very limited ways to customize your blog. That’s fine within the context of Medium, but it wasn’t really for me. After Medium I moved to Squarespace for a bit. Squarespace is very polished and easy to use. I would recommend to anyone, but it’s also limiting and it was those limits which annoyed me. For instance you cannot experiment on Squarespace. You cannot copy your site or play with other themes, all changes can only happen on your production site. You cannot modify templates except when you pay extra dollars per month. The functionality they offer is powerful and mature, but when they do not offer what you need, you’re stuck. I like the tinkering and missed it. So I decided to take the plunge and go back to hosting my own WordPress.